A sheep and a lamb gambol on a green hillside, the artists stand in a forest, they wear hoods – they could be shepherds. They aren’t of course, they are members of the outstanding trio of drummer Asaf Sirkis. This is the same trio that gave us Letting Go in 2010. And now this album, Shepherd’s Stories. It’s as if those three years are just a few minutes, as if time does not really matter to Asaf. The haunting harmonica of the earlier album has made way for voice and flute, and just as effectively. The trio has its own recognisable sound – a mix of out-of-this-world pulsating guitar trajectories and shimmering, sizzling, explosive percussion. The guests add more than colour, they add another dimension, a very human one that we can connect with. 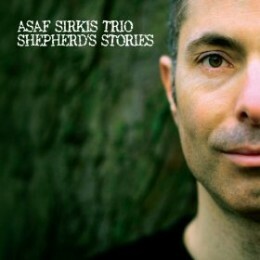 In the sleeve notes Asaf tells us that Shepherd’s Stories are reminders of where we have come from, they are metaphors for feelings deep within us, that come unprompted when we hear certain melodies. In a well-balanced album, this idea of atavistic memory is most strikingly demonstrated in two tracks – Traveller and Together. In Traveller, the gentle, cool and beautiful voice of Sylwia Bialas takes us to distant lands where shepherds guard their flocks, where simple tunes move us, where we feel at home. This simplicity is deceptive, it hides complex bass picking, the subtlest drumming and blended voices. Then in Together the ravishing, mellifluous flute of Gareth Lockrane takes me straight into the Middle East, to an almost biblical time. As a boy, did Asaf hear melodies like this one float across hillsides in his native Israel? It is quite timeless, Asaf is right, we already know this tune, this touching emotion, even though most of us lead urban lives. The opening is like the breathing you adopt in meditation, you push other thoughts aside as you relax. You might have imagined from looking at the instrumentation (guitars and drums), and hearing the searing guitar on the first track, that this would be a rock-jazz album but it isn’t, it is overwhelmingly serene and very rewarding. This album will definitely grow on you. Highly recommended.